Probably the quintessential Terry Gilliam film, Brazil provides an object lesson in how to create cinema with vision, blow an enormous budget, create an undeniable work of art that makes many viewers' all-time top ten lists, and yet still not achieve true box office success. It's a splendid example of imagination run riot across the silver screen, and although its story is very, very dark, it's told with such verve and panache that the whole thing feels like an amazing adventure... With dazzling visual effects and stunning sets, Brazil is a film that you should see on the biggest screen possible. Its tremendous atmosphere dwarfs the earnest performances of its capable cast, but that's exactly as it should be - for all their courage, these characters are nonentities struggling against an all-powerful, self-reinforcing government machine. The visual scope of Brazil is a potent metaphor for the power of forces unseen, yet their monstrous nature is balanced by a witty and affectionate script that emphasises the humanity of our heroes... See it for yourself and let it take your breath away. - Jennie Kermode, Eye For Film, 09 Feb 2009. It started with a dead bug. The squashed insect dropped into a typewriter at the Ministry of Information Retrieval; a bureaucrat typed the name Tuttle instead of Buttle; and poor apolitical Mr. Buttle, instead of the swashbuckling terrorist Tuttle, was taken away to be tortured and killed. Dear me, mistakes like this will happen in the Anglo-fascist fantasy world of Brazil. Imagine that Nazi Germany had colonized Britain after winning World War II, and you can visualize the film's architecture: mammoth and soulless, with huge intestinal piping that snakes through every elegant living room and posh restaurant. Imagine that the amiable English temperament was forced to accommodate itself to totalitarianism, and you can anticipate the courtesy with which the riot squad goons knock our hero, Sam Lowry, unconscious ("Sorry, sir, regulations"). Slogans of the police state are everywhere: DON'T SUSPECT A FRIEND-REPORT HIM. And scrawled on a tenement wall is the most obscene graffito of all: REALITY. There is not a more daft, more original or haunting vision to be seen on American movie screens this year. But until last week there was considerable doubt as to when, if ever, Brazil would find its way into a U.S. movie house. For months the film had been held hostage in the continuing guerrilla war between movie artists and the industry that bankrolls their dreams. In Hollywood, such skirmishes are usually waged behind paneled doors and result in compromises, ulcers and the final sullen handshake. But Director Terry Gilliam is no gentleman warrior. Finding his picture in distribution limbo after Universal Pictures refused to release his film (which he had shot according to the approved script and delivered on budget), Gilliam went public with a full-page plea in Daily Variety to the president of Universal's parent company, MCA: "Dear Sid Sheinberg: When are you going to release my film, Brazil?" Now Gilliam has his answer. The film that had been declared "unreleasable" won prizes for best film, director and screenplay from the Los Angeles Film Critics Association. This week Universal is playing it in Los Angeles and New York to qualify for Oscar consideration. It opens in ten cities next February. Gilliam has called Brazil "Walter Mitty meets Franz Kafka" and describes its unique, post-Orwellian setting as "somewhere on the Los Angeles/Belfast border." 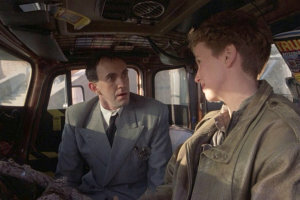 The film's hero, Sam Lowry (Jonathan Pryce), shambles efficiently through his job at the Ministry of Information records department but lives for his dreams, in which he is girded like Lochinvar, aloft like Icarus, fighting to save a fair heroine from giant samurai and evil, baby-faced thugs. One day he meets Jill Layton (Kim Griest), a truck driver who lived in the flat above the late Mr. Buttle's and looks exactly like Sam's dream girl. To be near her he accepts promotions in the bureaucracy and learns firsthand of its comprehensive brutality. By the end he has been betrayed by a very modern Mengele of a surgeon (Michael Palin), rescued by the revolutionary Tuttle (Robert De Niro) - but, alas, it is just another dream, Sam's last one - and lobotomized with nothing in his mind but the old Ary Barroso tune Brazil. The story should seem familiar: 1984 a year late. But as in so many key movies of the decade (Blade Runner, Diva, the Mad Max films), texture is text here, submerging the plot in a garage sale of 20th century detritus. Brazil is a place, like Stalin's Russia or the British welfare state, where everything is planned but nothing quite works. A Rube Goldberg spy machine kibitzes with a roving bloodshot electronic eye, then wheels away in a deranged gait. Giggling plastic surgeons do their "snip snip slice slice" with metal clamps and Saran Wrap. Sam and a man in the next office share a desk that each keeps yanking through his own side of the dividing wall. Every romantic impulse is stifled by the system's suffocating incompetence. In one poignant scene, Sam descends in an open elevator and ecstatically spots Jill on the lobby level - only to lose her as the elevator refuses to stop. During the nine-month wrangle with Universal, Gilliam, a Monty Python alumnus who directed the 1981 surprise hit Time Bandits, felt as forlorn as his hero. The studio, which had just emerged from a noisy battle with Director Peter Bogdanovich over the cutting and scoring of his film Mask, demanded in March that Gilliam reduce his 2-hr. 22-min. Brazil, already in distribution in Europe, to the contracted 2 hr. 5 min. (The average running time for the last 25 winners of the Best Picture Oscar is a leisurely 2 hr. 26 min. ; Universal's only other Christmas release, Out of Africa, runs 2 hr. 34 min.) When Gilliam delivered a streamlined cut that was still six minutes over the limit, Sheinberg determined to withhold the film until Universal minions could prepare their own version: shorter, more "accessible," and with a more "satisfying" ending, which the director believed would fatally distort his film. By this time Gilliam was seeing life imitating Brazil. Like Sam, he was being compromised by a "ruthlessly legal" cadre of apparatchiks. "If I go into Universal and even mention the word art," he said then, "security forces will come and take me away." These days the riot squad would have to look for Gilliam in seventh heaven. "The turnaround has been amazing," he says. "A week ago, this film didn't exist. Now it is winning awards and qualifying for the Oscars." For his part, Sheinberg sounds resigned. As he sees it, Gilliam is not the underdog of Brazil but the terrorist. "I personally wouldn't work with Mr. Gilliam again," he says. "But it has nothing to do with his talents as a director. I don't respect his talent as a human being." Cheer up, Sid. A terrific movie has escaped the asylum without a lobotomy. The good guys, the few directors itching to make films away from the assembly line, won one for a change. Universal has an award-winning picture. Think of yourself as Santa, Sid, and Terry Gilliam as the little boy who got to fly, like Icarus, for Christmas. - Richard Corliss, Time, 30 December 1985. New, restored high-definition digital transfer of Terry Gilliam's director's cut, approved by Gilliam, created on a Spirit Datacine from a new 35mm interpositive. Thousands of instances of dirt, debris, scratches, splices, warps, jitter, and flicker were manually removed using MTI's DRS and Pixel Farm's PFClean, while Image Systems' DVNR was used for small dirt, grain, and noise reduction. Colorist: Gregg Garvin/Modern Videofilm, Los Angeles. The DTS-HD Master Audio surround lossless soundtrack is quite impressive. Depth and dynamic movement are very good, while clarity is unquestionably superior. The raid scenes, in particular, sound fantastic. Acclaimed composer Michael Kamen's soundtrack also gets a strong boost. The dialog is crisp and clean. There are no pops, cracks, audio dropouts, or distortions.